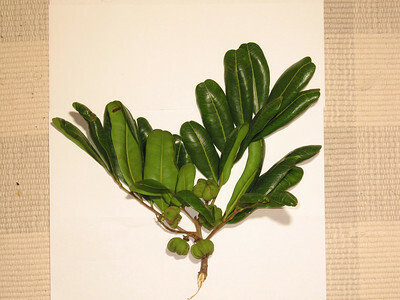 Other Latin names: Cupania anacardioides A. Rich. Description: "Small tree, young parts, petioles, petiolules, peduncles pubescent. Petioles 3-7 cm long; leaflets 5-11; petiolules 2-7 mm long; leaflet blades elliptic, obovate or oblong, apex broad, retuse, base cuneate, margin entire, 5.5-19 cm X 2.5-6.5 cm, shining, glabrous above, pale, glabrous or puberulent below, lateral nerves spreading, parallel. Panicles 8-25 cm long, pedicels up to 2.5 mm long; outer calyx lobes 2.5 mm long, inner 3-4 mm long, puberulent; petals 1.5-3 mm long; stamens 8. Capsules yellow, subglobose, 3-furrowed and 3-ribbed, apiculate, 1.5 cm X 1.5 cm, shortly stipitate, valves thick, wrinkled and puberulent outside, densely rusty tomentose inside; seeds almost enclosed by red-orange aril" (Stanley and Ross, 1983; vol. 1, p. 512). Habitat/ecology: "Mangrove forests, cypress swamps, tropical hammocks, coastal dunes and forests. Native habitats include coastal areas, lowland to upland rain forests, woodland and riverine forests. 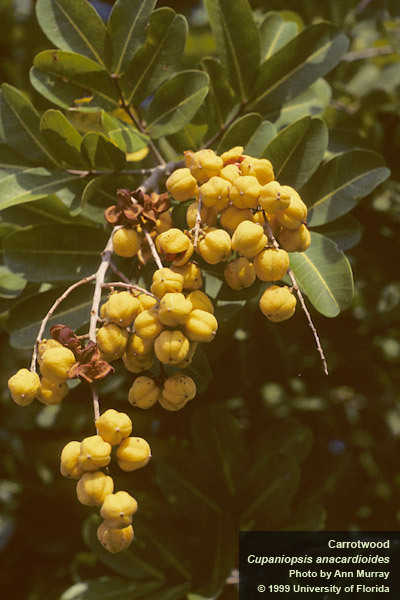 The tree is fast growing, salt-tolerant, grows in full sun and shade, and is adapted to poor soils. Where invasive, it forms dense thickets that crowd out native vegetation. Seedlings and saplings can reach high densities and alter the understorey habitat" (Weber, 2003; p. 129). In its native range (Australia), widespread in depauperate rainforests, on creek banks and on coastal dunes (Stanley and Ross, 1983; vol. 1, p. 512). Salt-tolerant. In the US (Florida), invades both disturbed and undisturbed areas and forms dense thickets, crowding out native vegetation (Randall et al., 1996; p. 31). Native range: Australia, New Guinea (GRIN). Chemical: Basal bark application of a triclopyr herbicide mixed with an oil diluent works well (Randall et al., 1996; p. 31). Cut trees and treat the cut stumps with glyphosate or triclopyr (Weber, 2003; p. 129).